In the course of the ongoing archeological excavations at the Yenikapı Marmaray construction site, the world’s best preserved shipwreck, a merchant vessel whose contents and wooden parts are in exceptionally good condition, was revealed. The archaeologists believe that the ship is from the fourth or fifth century and that it sank in a storm. Surprisingly, most of the amphorae on the ship are in perfect condition. The archeological excavation started in 2004 at the Yenikapı Marmaray construction site and reaches 8,500 years into the history of İstanbul. Skeletons, chapel remains, water wells and footprints, in addition to 35 shipwrecks, have been uncovered by archeologists so far. A 15 to 16-meter-long, six-meter-wide shipwreck loaded with dozens of amphorae found last May brings new historical data to life. The amphorae are shaped and colored differently than previously found examples. It is assumed that the ship was completely buried in mud and that this oxygen-free atmosphere protected the vessel and its contents from breaking down or being damaged. The ship was loaded with pickled fry, while almonds, walnuts, hazels, muskmelon seeds, olives, peaches and pine cones found on the shipwreck were also in good condition. Archeologist Songül Çoban says they need two more months to completely uncover the shipwreck, which was found four-five meters below sea level, adding that they were working eight hours a day and that such a detailed excavation was demanding. The shipwreck at Yenikapı is the only sample in near-perfect condition in terms of both wooden parts of the ship and its cargo in the world. 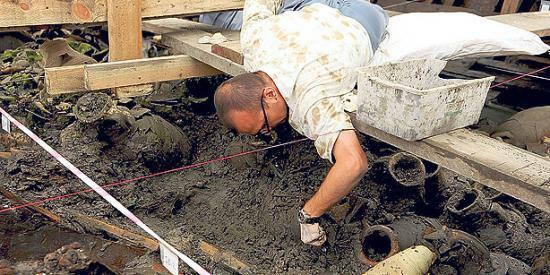 When the shipwreck was first discovered, the mud above it was cleared away and the damaged top layer of amphorae was removed piece by piece, after which the team began removing the undamaged amphorae below them. After all of the objects are removed from the shipwreck, the hull of the ship will be given to İstanbul University. The bronze nails found on the ship give clues about the age of the vessel and make it an outstanding sample. It is thought that bronze nails were used in ship construction starting in the fourth or fifth century, prior to which they only used wooden nails. The six-meter-wide ship is the only wooden vessel found in the world with its cargo intact. Information on departure and destination points and the ship’s route will be inferred by means of the artifacts found onboard. The archeological excavations of the fourth century port of Theodosius at the Yenikapı Marmaray construction site started in 2004. Since then, 40,000 objects have been registered in the inventory, while approximately 150,000 pieces are being studied and nearly 1 million cases of earthenware pots and plates have been uncovered thus far. All the pieces are classified and, if possible, broken pieces are restored. During the archeological dig, 35 wrecked ships, 30 of which are merchant vessels equipped with sails and five are galleys propelled by rowers, that sank between the fifth and 11th centuries have been uncovered. The dig at Yenikapı features the most shipwrecks of any dig around the world, while 45 archeologists and 265 staff members, consisting of architects and art historians, are still working at the excavation site. In addition to its exceptional features, the Yenikapı dig is the only excavation in the world that has gone on for seven years without interruption, as excavations generally take just a few months. The dig uncovers artifacts from various historical periods, the most recent of which is the late Ottoman era, while objects from the early Ottoman period, Byzantium, Rome, the classical period and the period before Christ have also been discovered.